Promotional floats, sometimes parades, were a commonplace in the Splendid Era. Even tiny towns got a glimpse when float routes passed their way. Our Liberty had a parade for The Greatest Show On Earth in 1952 that's still remembered. 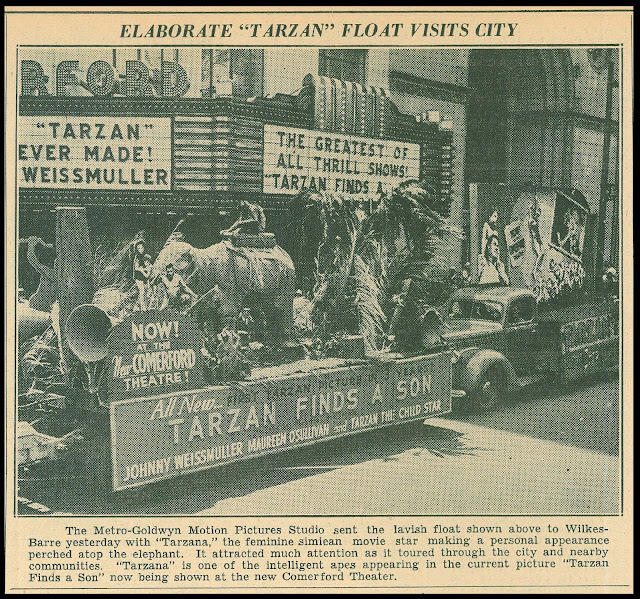 In this instance, however, it's Wilkes-Barre, Pa. and the Comerford Theatre dressing up downtown with multiple trucks decorated in papier-mâché with "feminine simian" star, Tarzana, propped aboard a mock elephant. I'm no series scholar: Was there a "Tarzana" featured in MGM's 1939 entry? Wonder if the monkey was chained to its perch ... almost had to have been, I suppose. Was there a handler alongside? Maybe this was a solitary ride for Tarzana. What cacophony came out of the loud speaker at lower left can be imagined. Neighbor merchants often complained of theatres whose street promoting got too loud. And where was traffic directed while all this went on? Think of effort applied to a show that likely ran not more than a couple days (the Comerford seated 1,884). This was where Metro exchange staff earned their pay, having to construct displays and herd them (plus Tarzana) about the territory as Tarzan Finds A Son wound through Pennsylvania. Maybe it was fun, but boy, think of the work. On Tarzan in general, and Maureen O'Sullivan specific, there is contrast twixt stills made of her before/aft Code enforcement. Advertising would be monitored like movies in that too revealing stuff got the airbrush or altogether nix. It's known that Jane's costume took on yards (as above at left), while portraiture of Maureen went wholesome in keep with fresh-face PCA edict. The above center was early, maybe even from her Fox Film Corp days, and represents posture that would be adjusted later on. Position of the legs, with inner thighs on view, was frowned upon after glamour shots got cautious and legs closed accordingly. What we'd see of thighs tended to be outer glimpse; inner implied access Hollywood was through giving. Still camera art became hair-split science and photographers/players learned rules well. Good as any sample of change is bundled-up publicity of Maureen at right. 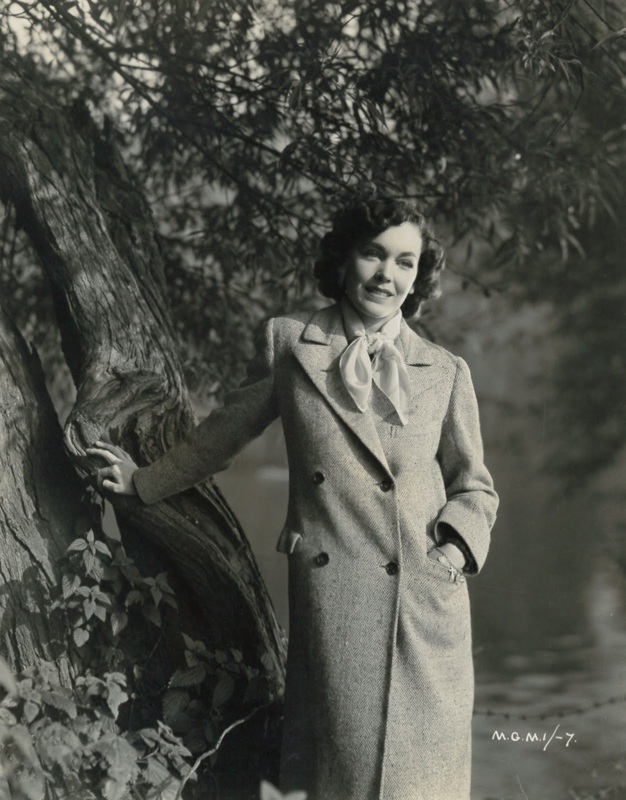 She and Metro camera artists would need an overcoat to withstand cold chill of censorship. Work it may have been, but at least the elephant was papier mache. The ones I find in my own profession tend to be alive. As for the Comerford Theater in Wilkes Barre, Pennsylvania, it was still in operation as first run venue when I saw "Nickelodeon" there in 1976. I believe that it is now the "F. M. Kirby Center for the Performing Arts."